Culture Horn Sound System is a weighty and heavyweight Russian dub sound system from the town of Kremenki in the Kaluga region in Russia. Built in year 2012, it managed to gather at least a dozen of musicians are around it, forming a big musical family from all over Russia. Armed with dubplates from local and international artists produced exclusively for CHSS, their sound is constantly being improved. Culture Horn Sound System plays a very important role in the local sound system culture and scene of Russia, not only playing uncompromising roots reggae and heavyweight steppers, but also releasing their own reggae and dub compositions on vinyl. 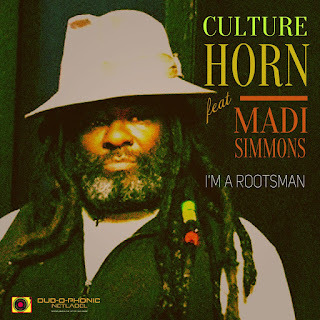 On their first release on Dubophonic, Cullture Horn collaborate with Madi Simmons, hailing from the USA and Dubophonic resident artist Med Dred, representing the likkle island of Cyprus. Madi has been performing and recording music for the last 20 years, going through lots of blood, sweat and tears in the music industry. Having toured the Pacific Northwest, Hawaii, California and the Midwest and being just recently voted as BEST MALE INDIE REGGAE ARTIST of 2018, Madi had a lots of ups and downs, nevertheless loving every minute of it and enjoying not following the rules of reggae music (whatever they are). The EP includes all together 6 tracks: The first one is done ina dubplate style followed by a melodica version by Jahpapu and an uncompromising CHSS-dub. The second one is the title track, followed by a special melodica dubmix by Med Dred and a heavyweight dub by CHSS, demonstrating the uncompromising style of the artists. Culture Horn Sound System is coming to shake your town!